At MOD Squad Dental, we understand the direct connection between a healthy mouth and a healthy life. At the same time, we appreciate the proven link between a beautiful smile and higher self-esteem, income and success. As a result, Dr. Friedman has dedicated himself to ensuring exceptional esthetics are built into each treatment plan. In fact, we do not view cosmetic dentistry as an elective procedure. We view it as the heart and soul of our practice and an important component of everything we do. Beyond the health of your smile, Dr. Friedman wants you to have a look that you’ll enjoy sharing with family and friends. 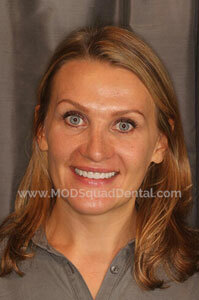 To this end, MOD Squad Dental offers a variety of cosmetic dentistry treatments. For patients who want to whiten their teeth quickly and safely, we use both the ZOOM! whitening system and KOR whitening system in the office for a dazzling smile in about an hour. Cosmetic bonding or porcelain veneers may be ideal choices for people whose teeth are chipped, slightly cracked, misshaped, or misaligned. If your teeth require orthodontic treatment, Dr. Friedman is a certified provider of Invisalign®. With these clear plastic aligners, your teeth will gradually shift into their proper position and no one other than you and our dental team may ever know that you’re wearing braces. If you thought porcelain veneers were your only option for tetracycline stained teeth, you’re in luck! The Deep Bleaching with KÖR Whitening system is the most effective way to add "WOW" to your appearance. It's sure to exceed your expectation. Your smile represents you. It's one of the first things you'll notice when you meet someone new. A whiter, more vibrant smile can help you feel confident and attractive. Natural aging can darken your teeth, while consumption of certain beverages, foods, and smoking will increase the staining. Thankfully, ZOOM!® professional teeth whitening can reverse years of aging in less than one hour. Nothing whitens teeth faster or better than ZOOM!®. Bright white teeth make you look younger and feel more confident, and our ZOOM! teeth whitening procedure can get you there in just 45 minutes. Make an appointment at our convenient San Diego office and in less than an hour, you’ll look and feel like a new person. No more cigarette or coffee stains, no more dark teeth – just a fresh, bright smile. Join the hundreds of patients whom we’ve given a professional and personal boost with our ZOOM laser tooth whitening. You’ll be so glad you did! ZOOM! Professional teeth whitening can reverse years of aging in less than one hour. Nothing whitens teeth faster or better than ZOOM! Our procedures also include porcelain veneers for patients who need just a little extra for that perfect smile. 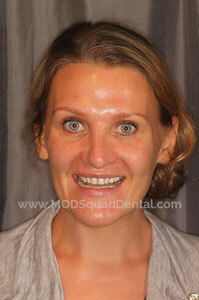 For our patients whose smiles could use a little MOD style, we sometimes use composite resin tooth bonding. Composite bonding can be used to repair chipped and broken teeth or to create a new smile. Tooth bonding is usually a one-visit procedure where composite materials are applied to duplicate the depth of color that occurs in a natural tooth. With Dr. Friedman's artistry, this composite can be manipulated to mimic the color details and translucency of a tooth and then polished for a beautiful shine. Bonding lasts for several years, and because the tooth structure is left undamaged and intact, it’s an excellent cosmetic solution for our younger patients. The back teeth are noticeable when we talk and especially when we laugh. Seeing dark, unsightly areas of metal can detract from what otherwise might be a perfect set of teeth. If you are concerned about how your fillings look, relax – we have several options available to correct this. Directly placed, bonded tooth-colored resin fillings can make a tooth look like new, whether they are used for small areas of decay or to replace current fillings. When it comes to a top-notch provider of San Diego porcelain veneers, patients just like you have trusted the name of Dr. Friedman and his team. These cosmetic dentistry innovations can give you a more youthful, natural-looking smile in just two visits. With our financing options, you can have a glowing look once again without financial hardship. A veneer is a thin, tooth-colored shell that is bonded to the front of your teeth to cover discoloration, chips, and gaps. Because they are stained to match the color of your natural teeth, a veneer will quickly hide blemishes and problems. They are so durable that today’s veneers last between 10 and 15 years. They also resist staining quite well, so your newly brightened smile will look as good 10 years from now as it does today. Dr. Friedman has streamlined his veneer-application process, allowing patients to enjoy a dazzling smile in just two short 1-½ hour visits to our clinic. If you have minor defects or alignment problems in your teeth, this is a very simple way to fix it without surgery or unnecessary risks. We offer financing to all patients so that you can improve your appearance without significant up-front costs. Convenient and affordable monthly payments make it easier than ever to afford cosmetic dentistry, so call our office today to schedule your free consultation if you are in the market for San Diego porcelain veneers. With Dr. Friedman’s help, you can sport a gleaming smile that you’ll be proud to flash for years to come.